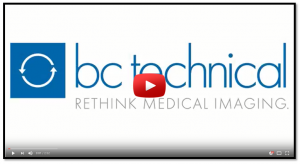 BC Technical can provide multiple upgrade paths to CT, MRI, PET, PET/CT, SPECT, SPECT/CT and Nuclear Medicine systems. These upgrades can range from subsystems all the way up to forklift upgrades. This includes replacement of outdated magnets, coils, consoles, tables, covers, workstations, etc. XR-29 Dose Check Software – Protect your reimbursements with XR-29 Dose Check. New requirements for scanners without dose alerts will impact your reimbursements. Stay ahead and extend the life of your equipment with BC Technical. Quickly communicate radiation dose information with patients with printouts available after exam / procedure completion. Re-assure patients that radiation dose is monitored internally while improving your brand. Offering dose printouts immediately following the scan / angio improves the experience, return rate and ROI. ClearCT Software – BC Technical’s next generation dose reduction software provides even better image quality while still providing the best dose reduction in the industry. Developed by radiologists, for radiologists. 4DM – Upgrading your 4DM cardiac interpretative license will provide you with up-to-date cardiac software and a Windows 7 platform. In addition to automatic processing and cardiac reorientation, 4DM provides a set of normal databases for all your SPECT and PET needs, HL7 output from the integrated report generator, CFR support and an optional CT option. CEDARS – Updating your Cedars cardiac interpretative license to the latest version will update you to a Windows 7 platform, give you a combined QGS+QPS mode, an improved ARG (automatic report generator) that includes HL7 output, ICANL and ASNC registry support, and improved quality control tools for your SPECT or PET data. BC Backup+ is a reliable and user- friendly image management system offering secure long-term storage of patient studies. It allows for the transfer of DICOM image data between Nuclear Medicine work stations plus allows for the usage of multiple types of image storage media. BC BACKUP +™ requires no additional software. Everything you need to back up and restore data is self-contained in the BC Backup +™ software. You can easily select the images you wish to restore, whether it’s a single scan, multiple scans, or all patient scans. In addition, BC Backup +™ enables users to create custom groups of images, sort and query based on established filters. ColdTRAC™ was specifically designed as part of an integrated monitoring service that automatically alerts up to 16 different contacts; including on-site clinical engineering personnel, Radiology Managers along with BC Technical Field Service Engineers. The ability to monitor both environmental and magnet issues allows this system to be a partner in keeping your system operational. Getting the right information to the right people allows fast repairs at the lowest possible cost. With the ColdTRAC™ system, prevention of unnecessary helium loss or magnet damage will no longer be a concern.